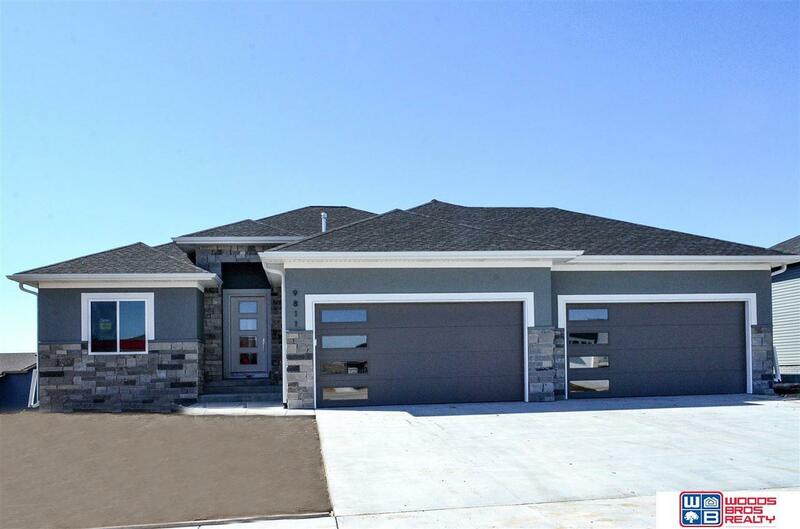 Newly designed ranch by Geysun Style Homes provides spacious living and many upgrades. Large living room greets guests with a cozy fireplace. Hardwood floors in the kitchen and adjoining dining room. The kitchen features an island with breakfast bar, granite counters with tile backsplash and great pantry. First floor laundry and mudroom with lockers is convenience that always appreciated. Master suite offers large walk-in closet, tiled walk in shower and double sink vanity. Both main floor bathrooms are tiled for easy upkeep. Walk-out spacious basement has 2 additional bedrooms, full bath, huge rec-room with wet-bar and a lot of space for storage. 34' x 10' Covered deck is great for outdoor entertainment. Oversized 4-stall garage has plenty of room to park and for storage/workspace. Covered porch with stone and stucco front enhances the curb appeal of this house. Home comes with full sod, UGS, garage door opener & sump pump. Located in fast growing Grandview Estates Subdivision.